The word Hispanic was derived from Hispaniola (Spanish speaking island) and the word Hispanic is meant to indicate all Spanish speaking people (including Spain), but leaves out Portuguese speaking people (Brazil). And more troublesome, onomatopoeically Hispanic sounds really bad. Angela Nissel is the author of two award-winning comedic memoirs: Mixed: My Life in Black and White and The Broke Diaries: The Completely True and Hilarious Misadventures of a Good Girl Gone Broke…..
With its plethora of cultural meanings, both positive and negative, Hafu is a term used to describe a Japanese of mixed heritage. Detailing the nuances of this hybridity, directors Megumi NISHIKURA and Lara Perez TAKAGI, both Hafu themselves, tell a compelling story of the voices and visibility of the Hafu identity with five stories of Hafu Japanese as they connect to their other roots in Australia, Korea, Venezuela, Mexico and Ghana to give us an absorbing look at ways of being Japanese. Erika Nishizato and Ken Tanabe, filmmakers involved in the production of HAFU, will be in attendance for Q&A. Written by a person of mixed ancestry herself, Leslie Silko’s “Ceremony” captures the conflicting reality of a person who is struggling to find his place in a modern world that is transitioning from the “old ways”. 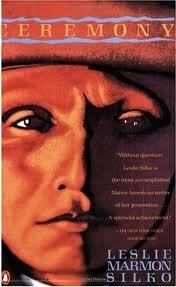 Tayo, the main character of this story, is the illegitimate son of a White man and Native American woman. As such he is the unspoken “shame” of the family, never being outright disowned, but never feeling completely accepted either. He is raised by his mother’s family along with his “brother” Rocky, who he adores. Rocky and Tayo end up signing up for World War II, but only one person returning home, Tayo. The book picks up after Tayo’s release from World War II POW camp and a mental and physical illness that requires a cure. The book represents Tayo’s journey to that cure through life, and ultimately a ceremony, which returns him back to life. One of the first things readers will notice with this book is the structure. “Ceremony” is not written in a straightforward manner (like I expected it too); rather it is a mixture of prose and Native American poetry. The plot also doesn’t follow along a linear path. Instead, it readily mixes memories from the past along with current events to give you deeper understanding of Tayo’s mindset. These memories are relived from Tayo’s point of view as he attempts to work them out. Tayo’s friends, who have also experienced war and discrimination, choose alcohol and living in the moment. Tayo, on the other hand, feels drawn to another answer. That answer is brilliantly worked out with the author’s use of language. As a result, you don’t just read Tayo’s anguish. Readers will feel the anguish Tayo has at being discriminated inside and outside the community. Readers will feel or the queasiness he feels when he feels sick. They will also feel the camaraderie between Tayo and his friends, his special relationship with his brother, and those who support him. Silko provides the good and the bad in strikingly realistic detail. That complexity, coincidentally, is also what might scare off casual readers. “Ceremony” is not the kind of book you read to escape reality for a few minutes. Characters are not introduced and full details about many of the characters are not described, rather they are revealed in their actions. It is paradoxical at times. That complexity actually bothered me a little but I got accustomed to it as the book continued. “Ceremony” immerses readers in Tayo’s culture and the search for identity. You get a glimpse into someone’s mind as they deal with the grim and (sometimes) ugly realities of the world-discrimination, prejudice, war, etc. In short, it is a book about journey. Not just any journey, but the journey to find one’s self again after facing the darker sides of humanity. By reconnecting with the time-honored tradition of the ceremony Tayo gains deeper insight into the wisdom that has been in his Native American roots all along. By looking back, he is able to move forward.